Triple Crown hero Justify remained a near-unanimous choice as the top Thoroughbred racehorse in the U.S. and no new names managed to crack the top 10 following a week with no Grade 1 stakes opportunities. The 13th horse to sweep the Kentucky Derby presented by Woodford Reserve (G1), the Preakness Stakes (G1), and the Belmont Stakes presented by NYRA Bets (G1) was taken out of training last week to assess a possible ankle injury, leaving his future racing plans in doubt. Justify received 41 of 42 first-place votes (worth 10 points each) and one second-place vote (9 points) in Week 25 of the poll of racing media, with the lone outlier being Horse Racing Radio Network and New York Racing Association broadcaster Anthony Stabile. The 419 points Justify earned put him well clear of Santa Anita Handicap (G1) and Gold Cup (G1) winner Accelerate with 337 points. Stabile has named Mind Your Biscuits as the top American racehorse in every poll he has participated in since Week 10, when the gutsy Chad Summers trainee won the 1,200-meter (about six furlongs) Dubai Golden Shaheen Sponsored by Gulf News (G1) on the Dubai World Cup undercard. 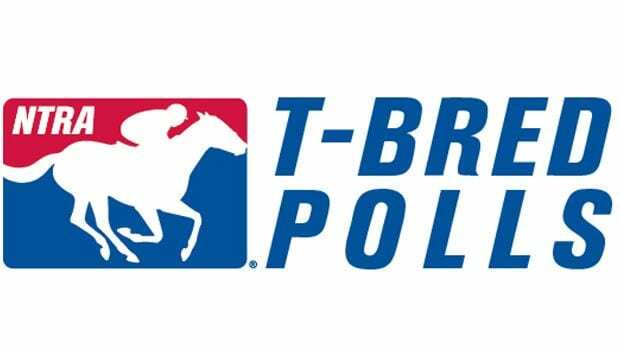 Three others ranked Mind Your Biscuits first during the month of April but those voters eventually landed elsewhere as more horses, including the top 3-year-olds, raised their profiles through the spring. Mind Your Biscuits is aiming to stretch out around two turns in the Aug. 4 Whitney (G1) and rated fifth (191 points) in this week’s poll. Bee Jersey (174), who defeated Mind Your Biscuits in the Metropolitan Handicap (G1), also known as the Met Mile, last time out, rose from seventh last week to sixth this week, swapping spots with superfilly Monomoy Girl (165).